Pakistan is believed to possess around 120 nuclear weapons. With the West distracted by entertainment, professional sport and the U.S. presidential elections, the war clouds that started gathering over the Indian subcontinent in September have now thickened after a threat from Pakistan that it will use nuclear weapons to "annihilate" India. The latest flare-up in the 70-year-old India-Pakistan conflict began after an attack on an Indian army base by jihadi suicide bombers infiltrating from Pakistan that left 19 Indian soldiers dead. India responded with what it called a "surgical strike" on the terrorist camps inside the Pakistan-administered part of Kashmir, resulting in "significant casualties" among the jihadi militants, in addition to some regular Pakistan troops. Pakistan's reaction illustrated the chaos that exists in that country's power structure. The reaction from Pakistan illustrated the chaos that exists in that country's power structure. While the civilian prime minister, Nawaz Sharif, denounced the Indian attack, the Pakistan military flatly denied any such attack had taken place. While Islamabad's civilian and military leaders couldn't get their acts together, the country's defence minister raised the possibility of a nuclear attack on Indian cities and troop formations. Talking to the Pakistani TV channel SAMAA on Sept. 26, Defence Minister Muhammad Asif said, "We haven't kept the (nuclear) devices that we have just as showpieces ... if our safety is threatened, we will annihilate them (India)." This wasn't the first he has brandished his country's nuclear weapons. 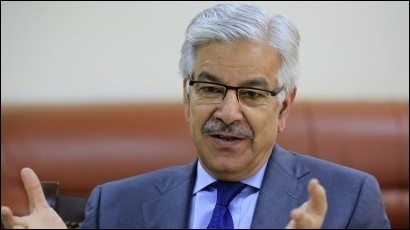 Pakistani Defence Minister Muhammad Asif threatened on Sept. 26 to "annihilate" India "if our safety is threatened." On September 17, Asif told Pakistan's Geo TV: "Allah has said in the Qur'an, 'The horses must be prepared', so we should always be completely prepared. ... if there is a threat to our security, or if anyone steps on our soil and if someone's designs are a threat to our security, we will not hesitate to use those (nuclear) weapons for our defence." While India, Pakistan's much more powerful neighbour, showed restraint in its rhetoric and military response to Pakistani provocations, Islamabad has been acting like a drunk gunslinger unleashing his goons to terrorize the entire neighbourhood. Pakistan's boasting about its nuclear weapons even came up in the U.S. presidential election. 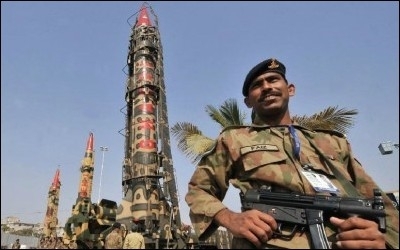 Days after the Islamabad's threat to trigger a nuclear war, the New York Times, citing a 50-minute audio that appeared on The Washington Free Beacon website, quoted Democratic presidential nominee Hillary Clinton expressing concern over the possibility of Pakistan's nuclear weapons falling into the hands of jihadists, which she called "a threatening scenario." [We] live in fear that they're going to have a coup, that jihadists are going to take over the government, they're going to get access to nuclear weapons, and you'll have suicide nuclear bombers. So, this could not be a more threatening scenario ... This is one of the most dangerous developments imaginable. Beyond Clinton's leaked comments, the only other Western politicians to raise the alarm about Pakistan are U.S. Congressmen Dana Rohrabacher and Ted Poe, who have tabled a bill in Congress to declare Pakistan a "state sponsor of terrorism." It's time for Prime Minister Justin Trudeau and his caucus (which includes two Pakistani-born MPs) to declare Pakistan a state sponsor of terrorism and shut down any aid or trade deals empowering Pakistan's military and its nuclear swagger. But will he? I doubt he understands the dangers of mushroom clouds over India and Pakistan. Perhaps Trudeau's Indian-born Defence Minister Harjit Sajjan should try to educate his boss.